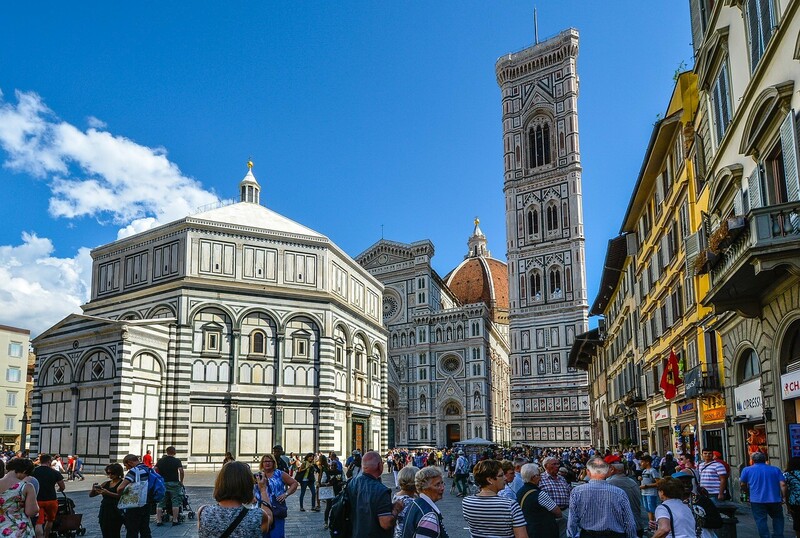 Piazza del Duomo is located in Florence and is considered one of the most visited and traveled places in the country. It literally means “Plaza of the Cathedral” or “Cathedral Square” and is basically the center of the area. 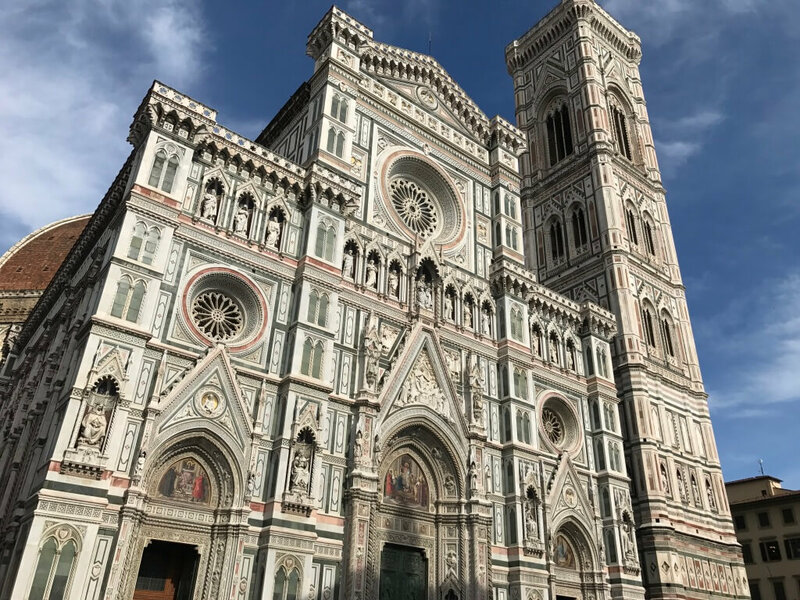 It consists of several buildings and attractions, namely: the Florence Cathedral, Giotto’s Campanile, the Florence Baptistery, the Loggia del Bigallo, and the Opera del Duomo Museum. The structure is dedicated to “Santa Maria del Fiore” and was designed by Arnolfo di Cambio. The façade and the architecture is done in typical Gothic style. The intricate detail of the architecture would astound you no end. The façade would leave you imagining how the artisans were able to craft the spectacle from marble. The interior holds most of the allure of the building. Brunelleschi’s Dome has come to symbolize the Duomo because of its grandeur. An engineering and architectural marvel, Brunelleschi’s Dome is the canvass for the largest depiction of the Last Judgement. The floors are spectacularly majestic as well. Almost hypnotic, the geometric patterns would also hold your interest. The walls might seem bare as they’re devoid of art but it only lends to the subtlety and the charm of the building. Stained glass windows lets a cascade of colors in as the rays of the sun play with it. Whether you look up or down or scan everything in between, you will have a glorious time absorbing the details. 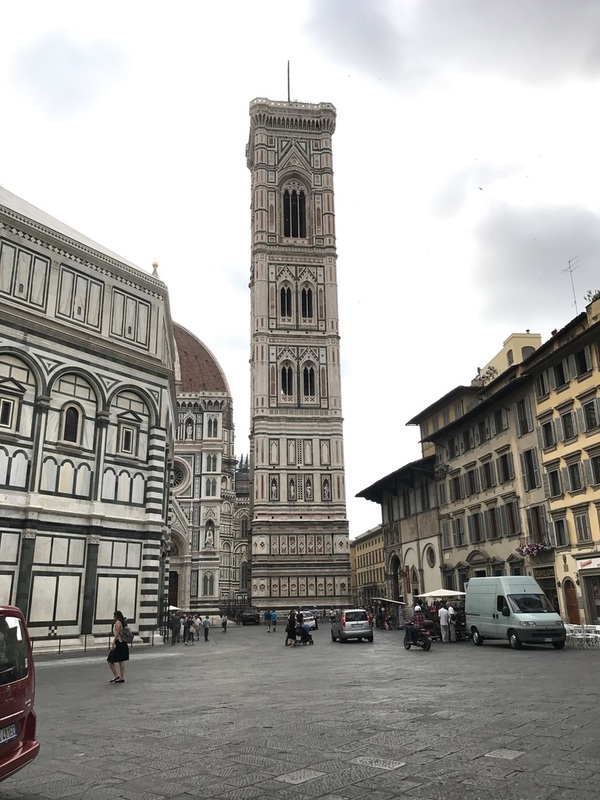 Considered to travel as one of the four primary monuments in the cathedral, Giotto’s Bell Tower is another architectural wonder in full display. The exteriors are in green, white and red marble which adds to the imposing structure. Those who wish to climb it would have to navigate 414 steps to look at the landscape from the top. Going down 414 steps is another matter altogether as there are no lifts in the structure. Still, visitors would be wise to note the details of the interior as it is still a visually stunning display of reliefs and statues. Look for the seven bells of the tower: the Santa Reparata (the largest of the group), the Misericordia, the Apostolica, the Assunta, the Mater Dei, the Annunziata and the Immacolata. Note that of the seven, six are appellations of the Blessed Mother. 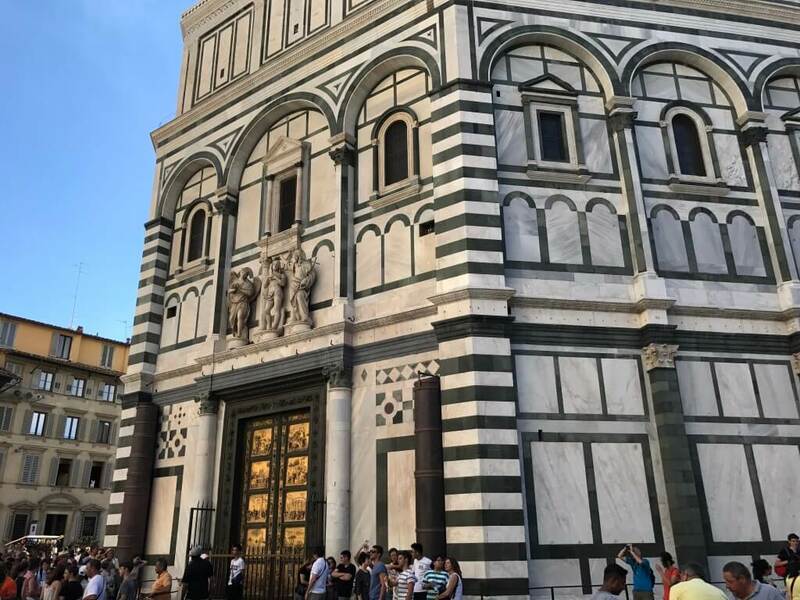 Officially the Baptistery of St. John, it is one of the structures that make tourists come back and travel here in Florence for more. The exterior looks unassuming even with the red, green and white marble inlays but is aesthetically pleasing nonetheless. Octagonal in shape with a cupola on top, it does hold a majestic view inside as the mosaics and statues all compete for your attention. The baptistery also holds the tomb of Antipope John XXIII crafted by Donatello and Michelozzo. One of the main attractions of the structure are the Doors of Paradise – as described by Michelangelo himself. It consists of ten rectangular panels depicting scenes from the Old Testament. 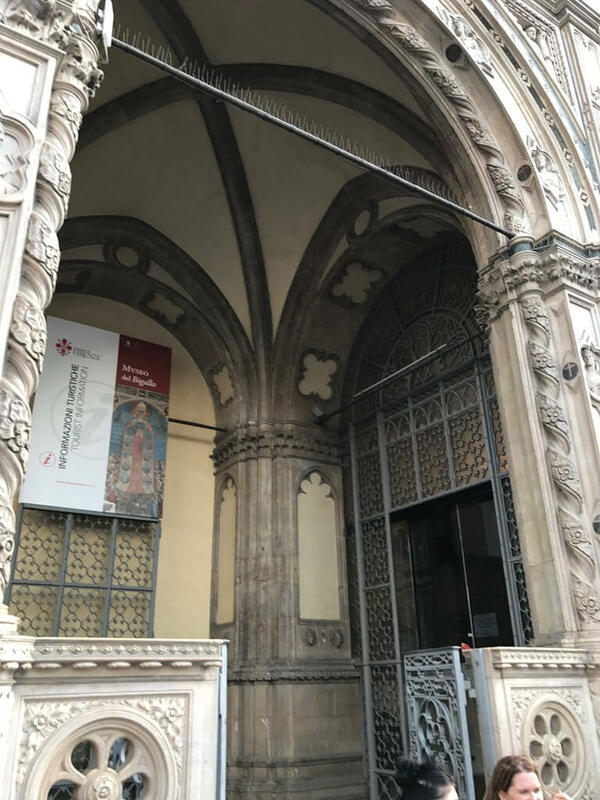 Framing the doors are 24 small bronze busts of renowned Florentine personalities including the artist behind the concept, Lorenzo Ghiberti. Tucked in the corner of Piazza San Giovanni and via Calzaioli, Loggia del Baggio boasts of high arched bays which displays bas reliefs of angels, prophets, Jesus, The Virtues and an Ecce Homo. Observe the admission hours – Pretty self-explanatory, isn’t it? Most of the sights admit visitors fifty minutes before closing time. However, there will be times when visitors would be asked to leave early due to liturgical celebrations, local authority’s advice, special events of concerned companies and bad weather. Mind the lines and the rules – Don’t get annoyed at the lines. Jumping and cutting the lines are frowned upon. Go with the flow and follow the directions. You’ll get to enjoy the spectacles soon enough. There may also be passes that have to be bought in order to access certain areas and/or amenities. Make sure to get them to avoid inconvenience. Remove helmets, bandannas, caps and other headgear – Except in certain circumstances, visitors are always advised to remove their helmets, bandannas, caps and headgear for security purposes. This makes it easier for security personnel to note the visitors and personalities and provide blanket security for all. Remove bladed and sharp objects from your person – For obvious reasons, defacement of the structures need to be avoided and prevented. Do not attempt to bring in bladed, sharp or glass objects inside as they will most probably be confiscated. Remember, these works of art are centuries old and need to be viewed with the proper amount of awe and respect (some say, even bordering on reverence). Take note of the dress code – Visitors who are clad with shoulder-, midriff-baring clothes as well as tiny, micro-skirts and shorts are discouraged from entering the buildings. While some of the statues in the buildings are naked, those who are viewing them need not be! Authorities are pretty strict about this rule and have turned away thousands who were deemed inappropriately clad. Utilize Yelp – Piazza del Duomo have large variety of cheap restaurants, stores, cheap caffè, and many more. We recommend to use Yelp application for your travel to check where can you find high review restaurants. Once you visit Florence, you might be overwhelmed where to is recommended to eat Italian Local Foods. Google Map for your travel – How can you find the place you wanted if you are not sure where is the direction? Thanks to Google Map. Travel with Google Map, Life is easier. Input the place you wanted and it will give you the directions either by walking, or a commute, or by car rental.